Greenfield City Manager Todd Wilkin speaks to the village council at its meeting on Tuesday. Updates on grants pending and yet to be submitted, weekly pothole filling, and LED bulb replacements in street lights were among the discussion topics at Tuesday’s Greenfield Village Council meeting. City Manager Todd Wilkin had previously discussed that the village was submitting applications for Community Development Block Grant (CDBG) funds and competitive capital improvement funds through CDBG that would allow for improvements to storm sewers, curbs and sidewalks on north Washington Street. The village also applied for a Natureworks grant that would allow for improvements at Mitchell Park. In total, the three grant applications add up to approximately $500,000, Wilkin said, and the village should know if it was awarded any of the grants by the fall. 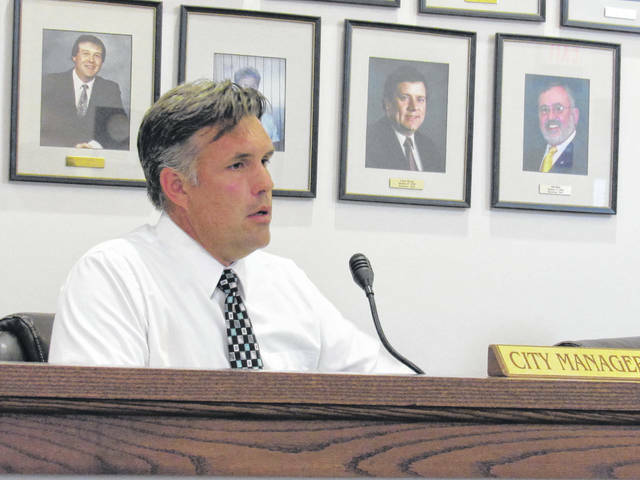 The village is seeking another grant from the Ohio Public Works Commission that would allow for the replacement of water and sewer lines on Mill Street, as well as curbs and sidewalks, Wilkin said. That grant will not be awarded until spring, he said. The city manager said he is also looking into “target of opportunity” grants and has reached out to the state for more information so the village can apply for more improvement funds. Also in his report to council, Wilkin said the Xenia Walking Club last week had an outing on Greenfield’s bike trail. “This is wonderful news,” Wilkin said, in regard to Greenfield being an attraction to non-residents. Wilkin spoke of efforts to improve the trails, including paving a portion of south Washington Street where the trail connects, a plan to fix the parking lot, and the addition of benches along the path with mile markers on them. According to the walking club’s Facebook page, this was the second year for the group to make the trip to Greenfield to enjoy the Paint Creek Trail. Other improvement projects around the village include some of the street lights getting LED bulbs, which so far is saving the village more than $1,000 a month on electric, Wilkin said. Bulb replacement throughout the village will happen over time, he added. There will also be an addition of two new LED street lights at Pleasant Hill Drive — one on the street itself, and one at the intersection with Hillcrest Drive. Those installations should occur around the first of August, Wilkin said. According to council chair Phil Clyburn, potholes are being filled weekly, and any resident can report the location of potholes within the village by calling 937-981-3500. Wilkin said village workers are currently filling potholes every Wednesday. Wilkin also reported that the yard waste site will be open again on July 27 from noon to 4 p.m. and July 28 from 8 a.m. to noon. It will again be at the Greenfield wastewater treatment facility located at 187 Lost Bridge Rd. The service is free to all Greenfield residents within the village. • Year-to-date revenue: $1.91 million. • Year-to-date expenses: $1.77 million. • General fund balance as of June 30: $245,911. In other financial matters, Greenfield has contracted with other law enforcement agencies house prisoners from overflowing jails, which Wilkin said could generate revenue for the village. Wilkin said that in June, the Greenfield jail housed some Adams County inmates, which earned the village $4,600. Greenfield Village Council meets on the first and third Tuesday of each month at 7:30 p.m. in council chambers, located on the first floor of the City Building. The meetings are open to the public.